Go Doctor Who - Page 2 of 40 - All the Doctor Who shopping you can do here! Doctor Who fans can now have this Tardis Large Mousepad. 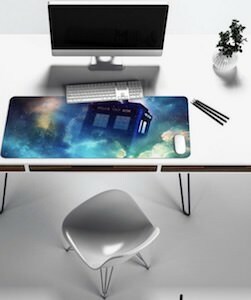 Sure you can have a mousepad that is just like 5 times the size of your mouse but if you like you desk to look amazing and with lots of space for your mouse then this large Doctor Who mousepad is what you want. This mousepad shows a foggy space and from those clouds you can see the Tardis show up. And you can get this giant mousepad in different sizes and it has a non slip back so that it stays in place while using your desk. People are going to love seeing this on your desk so come get one of these mousepads. 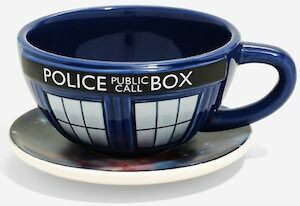 If you wonder what the Doctor drinks then I think the answer is coffee and it is probably made in this Tardis Coffee Maker. This Doctor Who French press is glass with on the outside of it a Tardis blue holder that even has the famous door and top sign on it and the lid is blue to and the plunger that holds the coffee grinds at the bottom is made from metal. So now you can make some amazing coffee when you feel like a caffeine kick or just to start the day. 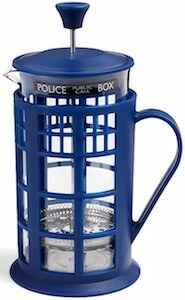 Adding this cool Tardis French press to your Doctor Who collection is just a given if you love to brew coffee. 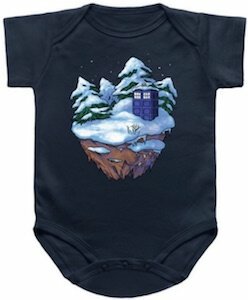 If you are a Doctor Who fan that needs to dress a baby then do so in this cute Tardis In Winter Baby Bodysuit. This Doctor Who onesie comes in dark blue, black, and grey and in sizes 6 – 24 months and all are made 100% jersey cotton. 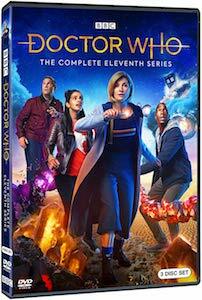 On the cute bodysuit you can see a winter wonderland with lots of snow on the ground and the trees and in the snow there is a special item and that is the Tardis from the Doctor that is just waiting for the next Doctor Who adventure. So getting the little one to become a Doctor Who fan like you can start right now by dressing it up in Doctor Who style. 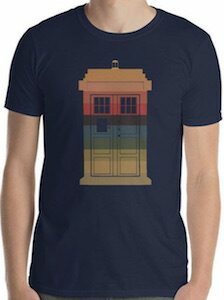 Now there is this Striped Tardis T-Shirt for all the Doctor Who fans that likes to show the world that there now is the 13th Doctor. The shirt is available in a bunch of colors and they are made from 100% ringspun cotton and come in men’s sizes Small – 3XL. On the t-shirt you can just see an image of the Tardis but this is not the normal blue police box because this Tardis is striped and the colors that are in the stripes look very similar from the outfit the 13th Doctor wears. So if you like the first female Doctor Who and want a cool Tardis t-shirt then this is what you need. Now there is a 13th Doctor Who Plush that is a must have for the true fans of Doctor Who. The plush is made by Superbitz and is rated ages 5+ and is 4.5 inches tall. 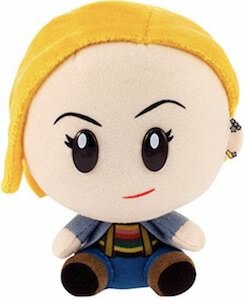 And as you can see the plush of the first female Doctor Who you know that it is based on the real doctor as she is wearing her amazing outfit and her blond hair and she even has her earrings and her friendly face. It is a great toy to play and cuddle with but also one that can just be on display in your home. And to make it a great display piece they even put her in a nice display box. 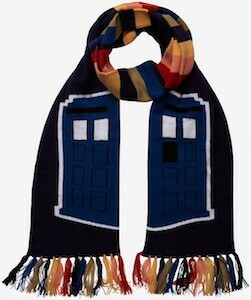 Doctor Who fan can now have a pair of I am Watching Dr Who Socks. These socks are just plain white but then when you get comfortable for watching Doctor Who and put your feet on the table then the messages shows up. On the bottom of one sock you can see the Tardis and the word “Shhh!” and then on the other sock it says “I’m watching Dr Who”. And the whole printing on the bottom of your feet also is nonslip so that you can keep walking on your socks inside without slipping. 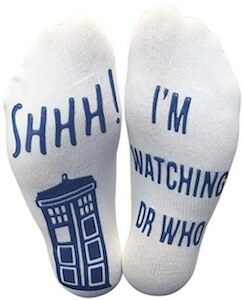 These fun Doctor Who socks are a great gift for men and women that love to watch Doctor Who. Now there is this Doctor Who I went to Gallifrey Canteen. This is an amazing looking wide mouth water bottle with a stainless steel lining to keep your drinks away from chemical leashed linings. And this Doctor Who canteen can hold 18oz in liquid and that makes it great as your everyday bottle for all your activities and even work and school. 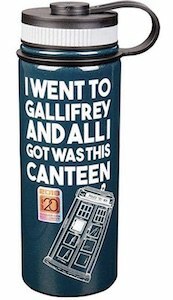 On the outside you can see that the bottle is teal in color and shows an image of the Tardis and the text “I went to Gallifrey and all I got was this canteen”. It is an amazing bottle and one that is not to obviously a Doctor Who item so only the true fans will understand it. Is it tea time yet? If so serve it in this Tardis cup & saucer set. No need to keep using a boring mug or even a paper cup because if you like to your tea in style then this cup & saucer set is just made for a Doctor Who set like you. The afternoon tea set is made from ceramic but it is hand wash only as it does not like to be hidden in a dishwasher. The cup of the set is Tardis blue with the famous doors on it and it even has the top sign on it. And then there is the saucer that has an image of the galaxy on it making it look like the Tardis cup is flying through the galaxy all at tea time.